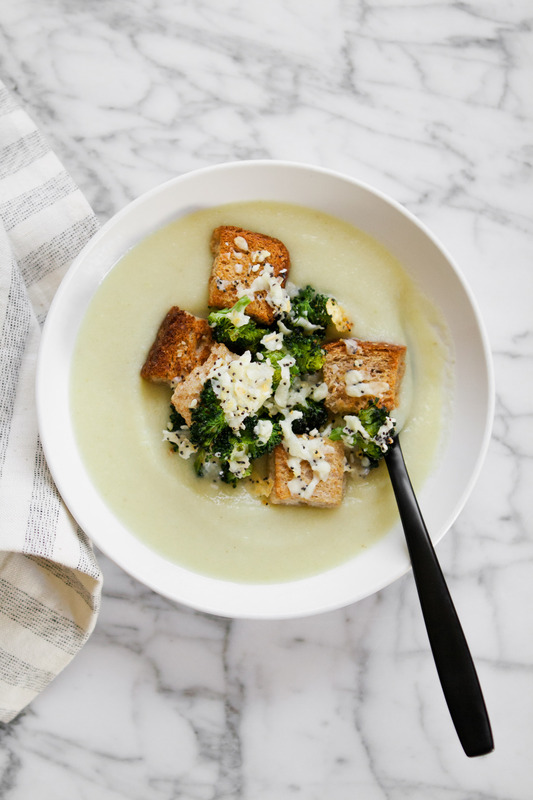 This luxurious, creamy broccoli soup is the perfect weeknight meal. Simmered and puréed broccoli stalks and potatoes offer an incredibly creamy texture without making a roux or using cream. Top with cheesy “everything” spiced croutons for a meal that’s healthy, satisfying, and delicious. Nothing quite beats a creamy, luxurious soup that tastes like it has cream in it, but in actuality relies on vegetables for its body and texture. Yup, this soup requires no roux. It’s pretty much a dump and cook kind of soup with a little puréeing at the end. It’s. That. Easy. This soup came about in part because I was on a puréed soup kick (I made many variations of this soup), but mostly because G loves roasted broccoli (thank God, it’s so easy). I like to roast the florets and reserve the stalks for snacking on and dipping, but one can only eat so many toot-inducing stalks before enough is enough. So we had A LOT of broccoli stalks piling up in the fridge. “Aha! These stalks could make another fabulous puréed soup!” I didn’t have to turn around to know Greg was rolling his eyes. Obviously I threw caution to the wind and ignored him. And damn, I’m glad I did. This soup is my kind of comfort food. 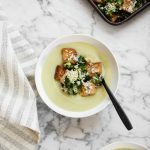 It’s a two-bowl kind of soup, creamy, comforting, and leaves you feeling satisfied but not weighed down. It’s finished with Cheesy “Everything” Spiced Croutons—and more broccoli—to bring the meal full circle. 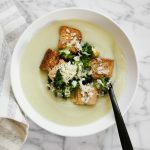 A creamy, luxurious broccoli soup that’s thickened with potatoes, not cream. It’s healthy, satisfying, and packed with flavor. Top it all off with cheesy “everything” spiced croutons for an extra dose of flavor. Heat butter and oil in a large Dutch oven or stock pot over medium-high. Add broccoli stalks, potatoes, onions, and garlic; season with salt and pepper. Sauté vegetables until beginning to soften, about 8 minutes. Stir in broth, Dijon, and zest, bring to a boil, then reduce to a simmer and cook until vegetables are tender, about 10 minutes. Meanwhile, heat oven to 400°F for the croutons. Off heat, purée soup with an immersion blender, or purée in batches in a standard blender. Stir in lemon juice and season with salt and pepper; keep warm until ready to serve. Toss bread and broccoli florets with olive oil then arrange in an even, compact, layer on a baking sheet. Combine Cheddar and everything spice, then sprinkle over bread and broccoli. Transfer to oven and bake until bread is toasted and cheese has melted, 6–8 minutes. Top servings of soup with croutons. To make this meal dairy-free: use 3 tablespoons olive oil in the soup instead of 2 tablespoon butter and 1 tablespoon olive oil. To make this meal gluten-free: use gluten free bread for the croutons. This homemade “Everything” Spice Blend is perfect for sprinkling over popcorn, roasted veggies, chicken, croutons, and much more! Combine garlic, onion flakes, poppy seeds, sesame seeds, and salt. Store in an airtight container.